We wanted to thank you so much for your time and help on our project! Caroline received a 100% on each section of the project! We appreciate your advice and suggestions! We learned so much! Please send me your email address so I can send you a picture of her presentation experience at school. We mailed your book back to you this morning! Thank you for the invaluable resource (and you too, of course). After reading and thoroughly enjoying “The Invention of Wings” by Sue Monk Kidd, three friends and I decided to take Lee Ann’s tour of the Grimkés. Her knowledge of Charleston and all its history is absolutely remarkable. We walked the streets where it all took place, and felt we relived a lot of what was in the book. We learned truths and untruths, and several interesting tidbits that were not in the book. A wonderful tour that we talked about for days afterwards! I would highly recommend it to anybody!! Recently, I had the rare pleasure of participating in a Grimké sisters tour with tour guide, Carol Ezell Gilson. Yes, I had read The Invention of Wings, and I thought I knew this tour because I had read the book. The tour, however, is so much more. As you walk the darkened alleyways and sunny cobblestones, the Grimké history comes alive. Not only do you learn about the incredibly brave Sarah and Angelina, you hear fascinating stories of many other family members that will leave you thirsting for more knowledge. It takes real passion to tell a story of the complicated way of life that existed then. Carol Ezell Gilson takes you back to a time that gives you reverence for two sisters who refused to accept a way of life that operated on the abuse of others. I can do this tour again and again because I am certain I would learn something richer and deeper with each excursion. Y’all are the best! I loved today’s tour. It was the best historical walking tour I’ve ever had. The Grimké Sisters Tour was interesting and enlightening. The time flew by. 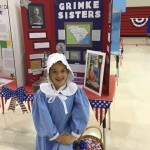 Carol Ezell-Gilson is a fount of knowledge about the Grimké family. She is careful to separate fiction from non-fiction and clarify research facts. 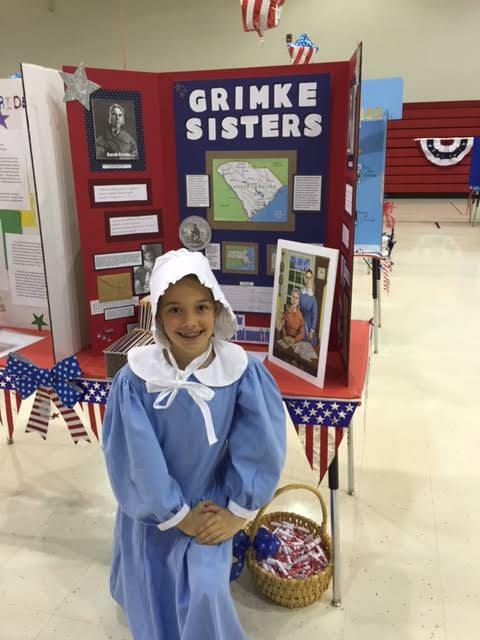 While Sue Monk Kidd was the spark for learning about the Grimké sisters, Carol related the documented history. I highly recommend this tour. While researching the Grimké Sisters for our National History Day project, we found out about this tour. Our tour guide, Carol Ezell-Gilson, was a great source of information. She took us all around Charleston to visit places where Sarah and Angelina had been. She had so many stories about these sister and their family, as well as, historical details of slavery, the abolition movement, and Charleston. We were able to use all of this information on our project and it helped us to win second place in the state competition and proceed to the national level. Your walking tour this morning was one of the best and most informative I have ever experienced. I can only imagine the amount of time and research that went into such a stellar presentation. Loved all the visuals, too! I would be interested in doing further reading about the Grimké sister. Would you mind sharing the reading list you referred to? Recently, I read Sue Monk Kidd’s latest book “The Invention of Wings” which is a story about the Grimké family. It wasn’t until I finished the story and read the epilogue that I realized the story was based on fact. The Grimké sisters were very real and lived in Charleston, SC in the early 1800’s. I called my son, who lives in Charleston, to ask him if he had ever heard of them and he told me about the tours. I made my plans for a visit and couldn’t wait for the tour! The tour was incredible. My tour guide, Lee Ann Bain, had really done her homework and told all sorts in interesting stories about the sisters during a 2 hour walking tour. One of the highlights of the tour was walking past the site of the “work house”. The tour was full of historical facts and beautiful 200+ year old buildings in an exquisite old city. I would recommend this tour for anyone! Our group thoroughly enjoyed your tour on Sunday. We were amazed at the depth of your “behind the scenes” knowledge and the ease with which you packaged it into our walk. Thank you for helping make our reunion trip to Charleston engaging and memorable.